Combination fragile, keep dry and this way up symbol and text. Packing and shipping stencil, for directly marking packages to comply with ISO 780. Available in four sizes. Packing and shipping stencils. 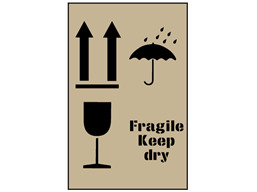 Combination fragile, keep dry and this way up symbol and text. Laser cut from heavy duty pvc plastic. Reusable. Available in four sizes. PSS1040 Size 300mm x 190mm. Material plastic. PSS1041 Size 300mm x 400mm. Material plastic. PSS1042 Size 600mm x 400mm. Material plastic. PSS1043 Size 800mm x 600mm. Material plastic.